If you've been reading this blog for awhile you know that I love station wagons and "sleepers". This car is both. 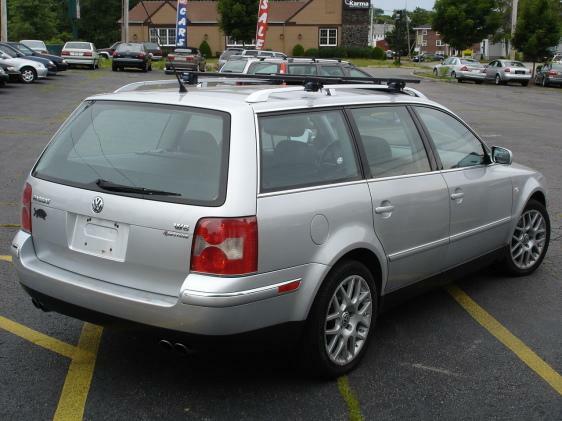 The Passat W8 4Motion wagon doesn't look a whole lot different from any other Passat wagon. Put a dog and a kid in the back and it looks like your typical mom-mobile. More accurately described as a ''double V'', (the) W8 (is an offshoot) of Volkswagen's proven narrow-angle VR6 engine. It uses two banks of cylinders, aligned at an angle of 72-degrees. But within each bank, pairs of cylinders are further separated at only a 15- degree angle. Each bank of cylinders is topped by a 4-valve head, each with dual adjustable camshafts. While vibration is controlled by a pair of balance shafts, which move in opposite directions at twice the speed of the crankshaft. Which is itself an unusual ''flat'' configuration, designed to maximize torque. Got it? Even if you don't understand all that (and I just barely understand it), what's easy to understand is the 270HP and 273 pounds-feet of torque this engine puts out. That's enough to get this car to 60 MPH in 6.4 seconds. All that power hits the ground through VW's 4Motion AWD system. Just imagine what kind of fun you could have with all that on a mountain road. These cars didn't sell well. There was nothing really wrong with them, it was their price that kept people away. $34,000.00 was A LOT of money to spend on a VW in 2003 (and now). For that kind of money you could buy an Audi, which was almost as quick, had an arguably more advanced AWD system and a far more prestigious name. But, in my mind, that's what makes this car so cool. It's not an Audi. It a VW Passat. People expect great performance and road holding abilities from an Audi. They don't necessarily expect that from a Passat. The W8 4Motion is a very cool sleeper. 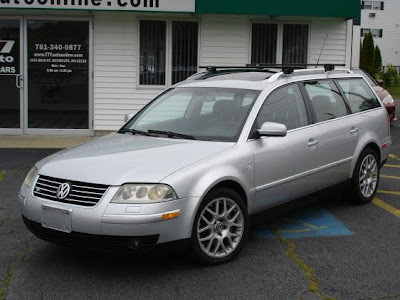 It seems like most of the Passat W8 4Motion wagons for sale these days have about 100,000 miles on them and sell for around $10K. I chose this car because it's a 6 speed (the automatic transmission raised the 0-60 time by a full second), appears to have been well taken care of and looks great in silver. Located in Weymouth, MA, click here to see the AutoTrader.com ad. 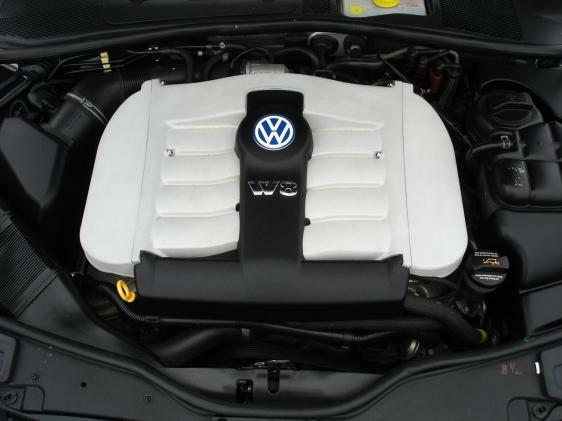 The W8 Passats have two major issues. These little screens will get sucked into the cam adjusters, which carries a repair cost of eleven thousand dollars, since the entire drive train must be removed before repairs can begin. Also, the torque converter lockup fails. Requiring replacement. This is a $4,000 bill at the dealership. And a 6 speed too! I drove one (automatic) for a week or two back in 2007, I really liked it. All the luxury and power, without the bling. Im thinking of buying one 1 2003 with 100,000 klms on the clock. Am i asking for trouble/ Or are these great cars? I love the idea of a really quick family wagon. I live in NZ big tall poppy syndrome here. So looks like the perfect car for me. A mid sized wagon with a V8 with 4wd, sounds great.Scared repairs may kill me though! 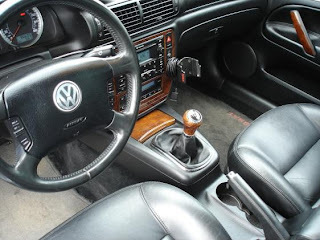 I own a 03 passat its 5 speed automatic with triptonic I love the car its amazing super fast (competes with my friends camaro) and smokes stock mustangs. I only have put an intake and straight pipes and it becomes a lot more alive jus from that! Id say buy one but get the warranty the repairs get a little pricey. But mine hasn't broke down at all or gave me problems yet I'm at 83xxx miles and it starts rite up everytime. I have a vw 2003 4Motion W8 Sedan. I love this car. However, I had a recall (for a heat shield) performed back in 2008, which was "cleared" by a certified VW dealer. However, the recall was not really fixed, and the issue began...millage rate was decreasing, yet I never smelt gas, and my fuel tank sensor appeared to be ok. The issue...as this was happenening my car was slowly losing gas-While at work last week I received a present underneath my car-a large puddle of gasoline. This, according to a certified mechanic for VW, is due to the recall never done in the first place. VW feels they are not responsible- even though the consequences of not fixing this issue could cause me my life. After purchasing this car, I dreamed of getting the eos, and had every intention, after selling this one, to stick with this company. It's not for the car, it's the customer service I am receiving that has really left a bad taste in my mouth-sort of speak. It is a safety issue- and it needs to be addressed. These are indeed great sleepers and fantastic long distance cruisers if not good mountain carvers (heavy) and can easily hit the speed limiter (U.S 130 MPH). Yes, they are infamous for torque converter failures (mine at 100K miles) and the cam adjuster problems (still waiting for that one). I have owned mine for around nine years and with proper maintenance (expensive) I have been able to enjoy mine for 150K miles so far. 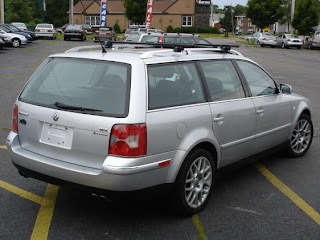 Owner of 2003 Passat w8 wagon with 127M miles. Replaced autotrans. at 116M miles with factory exchange unit at a cost of $6,800 dollars. At 126M miles replaced electric engine thermostat at a cost of $1500. Both times I swore I would sell or trade this car in, but both times I forgave it after driving it home. A pleasure to drive and can go any where. would like to see more comments about W8 owner ship experience. Love it! I have a sportscar with all the luxury and i just love it. I can't say more. Yes, brakes are more to fix than your average brakes, but so worth it! I am a engine geek and this is the best one out there! I have owned my 2003 W8 since new. What a fabulous car! Presently approaching 95K miles. Even though I had to endure two weeks down time while it had its cam screen problem corrected under warrantee at 40K miles, it is a pleasure to drive long distance cruising on the freeways or in the curvy mountain roads. The power to accelerate and pass is appreciated. The quality of the leather interior has held up beautifully, even though my Labradoodle is a regular rider. It has had some repairs covered by factory & extended warrantee i.e., leaking power steering pump, one(#7)faulty fuel injector, faulty engine control module, Faulty CV boot, radiator assembly, faulty drive shaft center bearing, faulty rear left wheel bearing, Faulty lift gate release motor and inop headlight replacement. Strongly advise any W8 owner to have an extended warrantee if you intend to keep a car as long as I do. Considering my 9 years of ownership my strongest criticism is the quality of the windshield. It is such soft glass that I have had to have it replaced twice due to pitting. Even sand will check it and mar visibility. Looking at new 2012 VW's, none of them offer the W8's power, AWD, handling, quality and standard ammenities in one package. Mine is a waggon with Tiptronic.